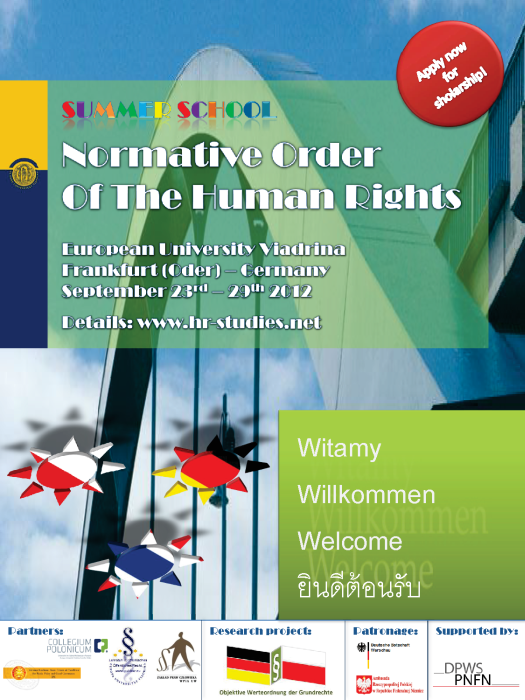 The Chair of Polish Public Law granted talented students and young graduates from Germany, Poland and Thailand scholarships, which enabled them to take part in a challenging educational Summer School to be held from 23^rd to 29^th September 2012 in Frankfurt (Oder), Germany. The Summer School formed part of a scientific research project, which was dedicated to the fundamental rights system in Germany and Poland. Just on the borderline between the two countries of concern, the students and graduates had the opportunity to discuss current and future challenges in the field of fundamental and human rights. As part of the programme, that focussed on legal issues but also was addressed to a large number of social, historical, political and economic issues as well, the participants travelled to Berlin. Participants were chosen by way of registering online. All applicants were obliged to add a nomination letter. Online applications were welcome. A jury comprising of the programme partners jointly elected the participants and scholarship-holders. The seminars, lectures and debating clubs were delivered in English. There was no tuition-fee and those participants selected had granted accommodation and a daily allowance.